Brandon Roy doesn’t have many off nights, but on Wednesday night against the Miami Heat there was no need for him to be on. The bench put the game on their broad shoulders. They become one of the best benches in the league. Perhaps even thee best. According to the stat kings over at 82.games.com, the Blazers boast one of the best scoring second-strings in the NBA. They are pitching in a combined 37.5 points per game, third best in that category behind the Minnesota Timberwolves (39.2 ppg) and the Los Angeles Lakers (38.5 ppg). But scoring isn’t everything. Portland’s bench also ranks among the top in rebounds (third, 17.3 rpg), assists (fourth, 8.4 apg), (third, 3.7) and blocks (fifth, 2.3 bpg). Another win only adds to those numbers, with a combined 49 points, 24 rebounds, 19 assists, 2 steals, and 5 blocks from the reserves in the victory. Not bad for one night of work, huh? When Channing Frye (17 points) shows off his range, Travis Outlaw (15 points) shows last year was no fluke, Sergio Rodriguez (11 assists) shares the ball, Joel Przybilla (9 rebounds) bangs the boards and Rudy Fernandez – well, he’s Rudy Fernandez (13 points) for crying out loud – it’s no wonder the “white unit” runs red hot against the rest of the league. Enjoy the night off Brandon. Chris Paul and the rest of the New Orleans Hornets await you after some turkey, stuffing and giving thanks. Speaking of bench guys, I grabbed time with Francisco Garcia of the Kings when Sacramento was in town on Monday and basically he’s dying to get out on the court for the first time this season. He’s shooting for this weekend. In keeping with the job demands of covering the entire league, here’s the skinny on Garcia…. Nate McMillan is having a hard time breathing these days. Nate’s caught that nasty winter bug that’s been going around (I can relate) and was popping throat lozenges like a madman before the game. I’m not sure if he’s breathing any easier after watching the Sacramento Kings – the injury riddled and five-whole-wins Sacramento Kings – come into Portland’s house and basically push them around. On a night when the Chicago Bulls used a last second shot from Larry Hughes to beat Utah – at Utah – the Blazers could have been the second upset of the night. They dodged a Sac-town bullet. 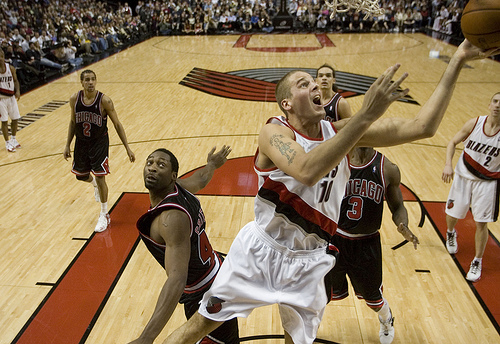 Greg Oden didn’t dazzle, even though Brandon Roy certainly did. Yet if McMillan was handing out game balls afterwards, the one and only should have gone to Joel Przybilla. Peep the statline: 10 points, 12 rebounds and 2 blocks in roughly 28 minutes. Oden may have got the start, but Przybilla finished and he finished strong. 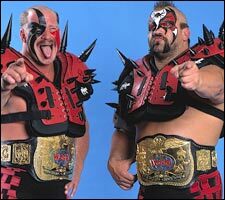 We know who was who versus the Kings. It’s hard to argue with McMillan’s decision to start Oden. As he said before Portland hosted Sacramento, “he wasn’t going to come off the bench the whole season.” Maybe so. But on Monday night at the Rose Garden, Przybilla gave McMillan every reason to keep Greg on the bench and his playing time to a minimum. That’s just Joel being Joel. Guess you could say he was a breath of fresh air. King For One More Day? I highly doubt Reggie Theus is on Facebook. But if he were, it’s likely his status update would read: Reggie Theus is feeling the pressure…. So when is the right time then? At what point in the season do the Kings assess Theus’ job, knowing his departure could be the result? Regardless of the time, two seasons – or one season and 15 games – is far too soon to expect greatness from a head coach, particularly for a team hobbled by injuries (Kevin Martin, Francisco Garcia, Mikki Moore) and relying on a couple vets and some novices. Theus earned 38 wins last season – his first with the Kings. Now at 5-10, Sacramento may have a tough time improving or drawing close to that number. But does that mean Theus should go? Gregg Popovich only won 17 games his first year in San Antonio. We all know what he’s been able to do capturing four rings since. Mike D’Antoni only mustered 21 wins taking over the Phoenix Suns in 2003-04. We all know he made the Suns go in 7 seconds or less for five years. Heck, even Nate McMillan won 21 games his first season in Portland. Last year the Blazers ended the season at .500, and this year they have a chance to win nearly 50 games and perhaps make the postseason. Could you imagine if McMillan had been let go two years in? These things take time. Ask P.J. Carlesimo about that. Rebuilding can’t be rushed. In Theus’ case, two seasons may not be enough to put a franchise like Sacramento back on the track to success. Then again, it appears ownership and upper management are at odds on his evaluation as Theus’ hot-seat heats up. Reggie’s in a tough spot. That didn’t take long. 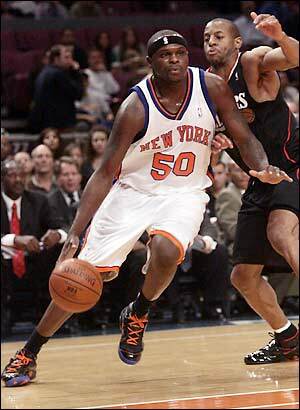 Late word out of New York has Zach Randolph on the move once again. Multiple sources have confirmed and are reporting a three-way trade between the Knicks, Los Angeles Clippers and Golden State Warriors. Randolph would head to the Clippers and Jamal Crawford to the Warriors, with the Knicks receiving Al Harrington from the Warriors and Tim Thomas and Cuttino Mobley from the Clippers. Ink hasn’t dried yet but it appears to be a done deal. Essentially it’s a salary clearing tactic for the Knicks. All three contracts they receive expire in 2010. The deal could be finalized as early as Friday afternoon. After averaging 17.6 points and 10.3 rebounds his first year in New York, Randolph is putting up 20.5 points and grabbing 12.5 rebounds playing out of position at center for head coach Mike D’Antoni. Welcome back to the Western Conference Z-Bo. Sam Amick has covered the Sacramento Kings for the past four seasons (and some change), so who better to help scout the Kings than the beat writer from the Sacramento Bee. In what has become a sporadic game day tradition, various beat writers, bloggers, online journalist and columnists will join me throughout the season in bringing you an inside look at teams from around the league as they prepare to take on the Portland Trail Blazers. Today it’s all Amick with the Blazers (7-5) visiting the Kings (5-8) on Friday. 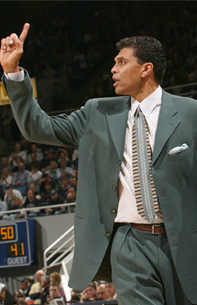 Man, Reggie Theus looks like a young Lando Calrissian in that throwback…. Is this how you thought the season would start for you guys? Well I’d obviously be a liar if I said yes. The injuries (Kevin Martin and Francisco Garcia mainly) have opened up minutes for some of the young guys, and they have mostly surprised in a big way. Rookie forward Jason Thompson has been very good, fellow rookie Donte’ Greene just broke out for 15 points in his first start and second-year center Spencer Hawes has taken a quantum leap from last season. Now as to their recent Jekyl and Hyde road trip (lose to Memphis and beat New Orleans) that happened time and again last season when they fell to horrible teams and downed great ones. That was my next question….the Kings lose to the Grizzlies and then turn around and beat the Hornets. Who are these Kings right now? It’s something else though, that phenomenon. On the one hand, you’ve got to call it a lack of focus against bad teams and some complacency there. On the flip side, I wonder if the lack of pressure or expectation when they face good teams allows them to play much more free. I can’t explain it, though. You mentioned Martin and Garcia, who else should Portland be concerned with? I’d say (Jason) Thompson. Considering there was a time not too long ago when the Kings were pondering ways to get the Blazers’ own LaMarcus Aldridge via trade, they’re now hoping the rookie out of Rider University is the answer to a power forward problem that has been there since Chris Webber left town. Portland and Sacramento last met in the preseason at the Rose Garden when Greg Oden had his way with both Spencer Hawes and Mikki Moore. How do they contain him this time around? I think they may just ask Greg to lighten up a bit. Other than that, there’s not much they can do other than agitate him right when he gets the ball on offense and surround him on the glass with the intent of poking the ball wherever he’s not. The Kings have been getting killed by the three-ball, so you won’t see much doubling down low. 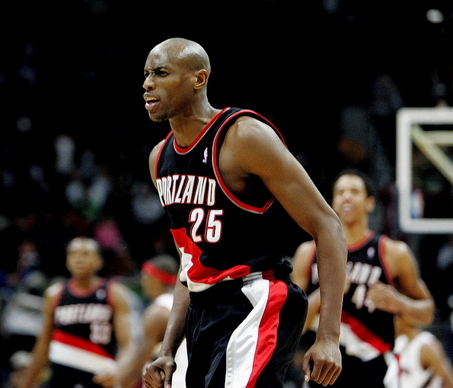 Last one for you….former NBA point guard Kevin Johnson was recently elected Mayor of Sacramento. How does Johnson being in office benefit the Kings’ future in Sacramento? Or does it? Without knowing all of his politics (I don’t vote because I live outside the city), I do see it as a good thing. On image alone, he brings a major boost to a city that needs it right now. What’s more, the backdrop is that of an incumbent mayor in Heather Fargo who is widely perceived as solid but far from dynamic. I know the Maloofs love the pick, as it certainly doesn’t hurt their efforts to get a new arena built in Sacramento if only because Johnson places great value on the Kings being here. It’ll be interesting. Big thanks to Sam Amick for his time. For the latest out of Sacramento make sure to check out Sam on the Kings Blog on sacbee.com. This probably isn’t going to be the most popular opinion in Rip City right now, but Joel Przybilla should continue to be Portland’s man in the middle. It goes beyond what he was able to do against the Chicago Bulls on Wednesday night when he with finished 14 points and 9 rebounds. Instead, it’s about continuing to provide Greg Oden with a certain modicum of easiness after the hectic history of his oh so brief career. The truth is Oden fits into the second unit as smoothly as Travis Outlaw, Rudy Fernandez and a fastbreak. Besides, how many players in this league spit the old cliché: it’s not if you start, but if you are on the floor to finish the game that counts. And right now, that is what Oden is doing best – finishing. One more of those power dunks and this is bound to be the result….. The truth is, Portland has the best of both worlds with Przybilla tag-teaming with Oden. They combined for 24 points, 6 blocks and 19 rebounds against the Bulls. What could be better right now for the Blazers? Przybilla is cleaning up the garbage. Oden is finding his groove and might actually be enjoying himself. Better yet for Nate McMillan, the wins are mounting. That’s hard to argue with. Another busy week over at HOOPSWORLD…..will James Posey’s championship experience pay off in New Orleans this season? I dove into the discussion thanks to some thoughts from Posey who turned down returning to Boston for a change to win with the Hornets. Will he be the difference maker for New Orleans?